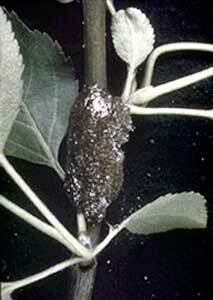 Primarily found on species of Malus and Prunus but sometimes feeds on other deciduous trees. Common hosts are ornamental crabapples and cherries. This tent maker initiates and gradually enlarges its web in the crotches of the branches of its host. 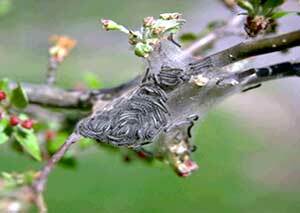 On warm, sunny days, the caterpillars will emerge from the web, which is used mostly for thermal protection on cold spring nights, and feed on the expanding foliage. Often, there will only be one tent per plant and not all similar plants within close proximity will be affected. Damage can range from light to heavy defoliation depending on the size of the tree attacked and the number of webs per tree. The caterpillars are dark, moderately hairy, and have a distinctive white stripe going down the length of their backs. At maturity, the larvae are 1 1/2" - 2" long. 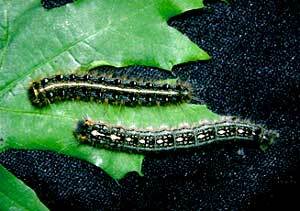 They resemble the larvae of the Forest Tent Caterpillar, which has white "keyhole" or "footprint" markings down the length of its back, and not the white stripe. The adult moths appear in late June to early July and are rarely recognized due to their innocuous appearance and short life span. After mating, the female will lay a batch of eggs, about one inch long, around the stems of 2-3 year old branches (primarily). These egg masses are covered with a shiny black material and house upwards to 350 eggs. These eggs will over-winter and hatch soon after budbreak on the host plant. The caterpillar stage lasts about 5-6 weeks. During the winter and prior to budbreak, susceptible hosts can be monitored for the presence of egg masses, which can be pruned out and destroyed. 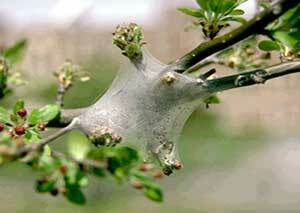 Also, newly forming webs in the spring can be pruned out or physically removed by hand, when the larvae are in the web. One should not use fire to burn out these webs; this can cause much greater injury to the host than this pest ever could. Bacillus thuringiensis (B.t) works well, especially on the younger larvae. Insecticidal soaps are effective on the younger caterpillars and should be applied only when the caterpillars are out of the tent and on the stems and foliage in order to achieve proper coverage. Many chemical insecticides are also labeled for this pest.